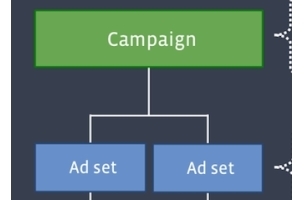 As you probably already heard, Facebook launched a new campaign management hierarchy called ad sets. The feature, released earlier this month, is intended to help advertisers keep organized and drive results using their campaign objectives. With ad sets, advertisers can now set budgets and schedules for each of their ad sets and organize them by target audience. As advertisers, it is great to hear that Facebook is cleaning up and rearranging our ad environment — a lot of us have done endless amounts of busywork creating new campaigns for each of our target audiences. It’s good to know that we will be saving time and money by optimizing our campaigns with these new ad sets. But let’s examine this new feature and figure out how to get the most out of it. This new feature has highlighted the importance of knowing your advertising objectives, as your campaigns will each be based on your end goals. To define your objectives, you must ask yourself what your main goal is for each campaign: Do you want clicks to your website, new page likes, or application installations? After defining your objectives, you are able to create campaigns that work to bring in the results you seek. Your objectives are defined for each campaign, and the ad sets will set the budget and schedule for each target audience. With clear goals, Facebook will get you hard results that you can then compare to your other campaigns to see what works best for you. Facebook’s plan is to move advertisers into an organized work flow that will help them drive results by their objectives. Advertisers no longer need to host new campaigns for every target audience. Facebook’s new feature is helping advertisers stay organized by breaking up each campaign into ad sets and applying a name to each ad set. Old campaigns will be labeled ad Set 1, ad Set 2, and so on. But by labeling your new ad sets with descriptive names that define the audiences they are targeting, it will be much easier to test both targets and ads for their unique attributes and optimize to those that perform best. News flash: A/B testing is an important part of Facebook advertising. If you are not allocating a budget for testing, then I can tell you now that you are doing something wrong. Set a realistic amount of time and budget to put toward A/B testing because this is what ultimately will drive the best results for your advertising budget. 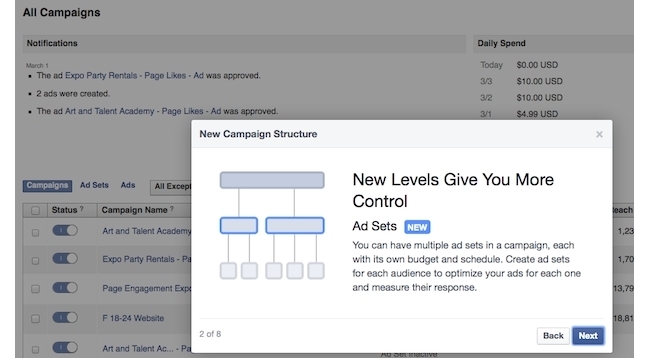 With ad sets, Facebook has given advertisers the ability to group ads based on various targeted elements. Utilize this to see which audience responds to what messages. Now when all is said and done, there is one thing that matters to an advertiser — results. In the past, you had to manually calculate your results to see which campaign was doing best for which audience. Now, Facebook made it easy to compare the results of all of your ad sets in order to best optimize your campaign to reach your objectives. Joe McCormack has spent the past decade in the online marketing industry. He built and grew the Adotomi Performance Agency, which was acquired by Matomy Media Group in 2013. He has founded several companies including Adquant, a Facebook Preferred Marketing Developer, where he is the current CEO. Joe is a leading figure in the ad tech world, sitting on the boards of several companies and appearing in publications like CMO.com, TechCrunch, All Facebook, and Inside Facebook.